Wendy's Eagles Helping Others Find Hope in 2019 — Wendy S. Harpham, M.D. What’s the big deal about yet another cancer walk? To answer, let me take you back to 1993. What can I hope for now? What should I hope for?” Those questions popped into my head after receiving the devastating news that my follicular non-Hodgkin lymphoma had recurred. I say “devastating” because all I’d ever wanted to do was care for patients and raise a family. That recurrence less than a year after completing intensive chemotherapy meant closing my solo practice of internal medicine to receive more treatment. It also meant my long-term prognosis was terrible. Even with the best available treatments, cancer threatened to take me from my husband and our three children, only 3, 5, and 7 years old. Hope led me to the Lymphoma Research Foundation. 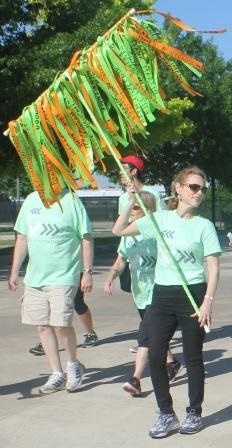 You see, hope of speeding up progress motivated me to help found the Dallas chapter and to form Wendy’s Eagles, a team of walkers that has participated in the walk every spring since. Without that hope, I’d have never mustered the gumption needed to do something outside my comfort zone: ask people for money. Hope of research finding answers keeps me at it, year after year. Once a year I post about Wendy’s Eagles. Click here if you would like to support this effort to help others. Thank you to those of you who already have made donations or registered to walk. Together, we are making a difference.